This recipe is for all those out there who dip Oreos in peanut butter! Oh man, I am slightly addicted to my new granola. Every time I walk by the kitchen I grab a handful. So let's start with the obvious...this is not the healthiest granola out there. However, I do believe it is one of the tastiest! 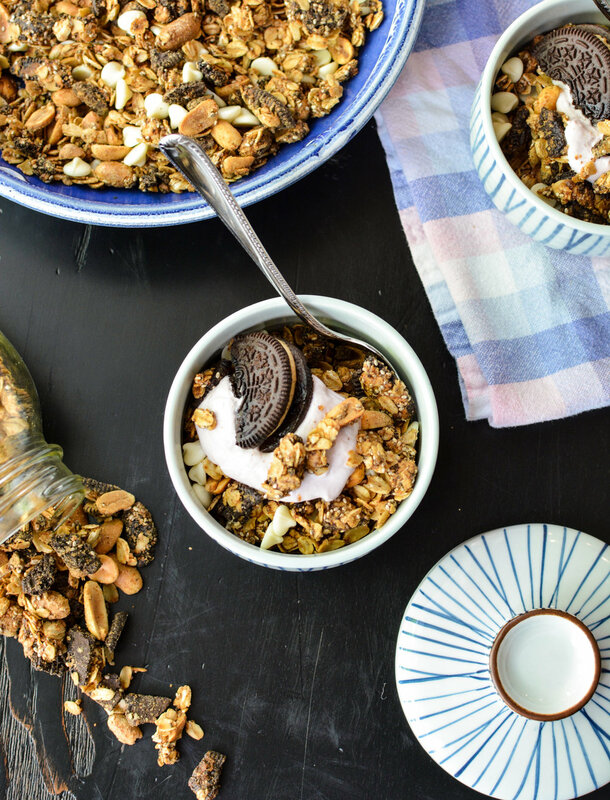 The granola is made up of peanut butter coated oats and chia seeds mixed in with peanuts, crushed Oreos and white chocolate chips! You can expect to have crunchy granola bits with clusters throughout. As I said before, be prepared for this to be very, very addicting! You can enjoy it on top of yogurt, ice cream, smoothies or by itself! Now for a little insight into the process behind developing the recipe. I used standard jarred peanut butter for my first iteration but the granola ended up having grainy peanut butter coating that wouldn't get crispy - not exactly ideal. I turned to powdered peanut butter, an ingredient I used before in my peanut butter meringues. It worked out perfectly!